After last week’s confusing acceptance of former UVA QB Greyson Lambert’s transfer, very shady rumors led us to believe that one of the incumbent Georgia quarterbacks was on his way out. We have confirmed that man it is redshirt freshman Jacob Park. Despite his pedigree (U.S. Army All-American, consensus top-1oo player and 4-star recruit), it was made evident in the spring that he was running well behind presumptive starter Brice Ramsey and even Wildcat QB Faton Bauta (whom I can’t believe hasn’t moved to tight end). Given Lambert’s experience (and the lack thereof on the rest of the depth chart), it is pretty evident that Park was going into fall camp running fourth on the quarterback depth chart. Add 5-star mega recruit Jacob Eason in the class of 2016, and one could reach the conclusion that he was never going to see the field. 1) Park’s transfer frees up a scholarship tied to Lambert, Lambert is gone in two years, when redshirt senior Brice Ramsey and (hopefully redshirt freshman) Jacob Eason battle it out. 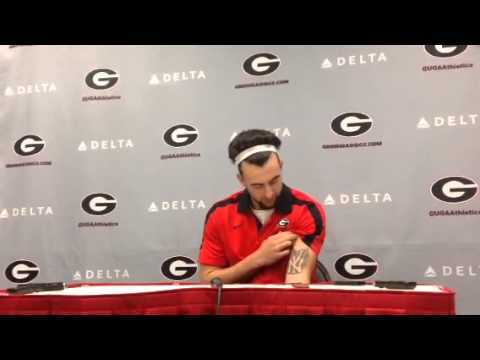 2) Georgia has one less player rocking the skinny headband AND a g.d. New York Yankees tattoo. Posted on June 10, 2015, in Daily Dose of Dawg, Georgia Bulldogs, Recruiting, SEC. Bookmark the permalink. Leave a comment.